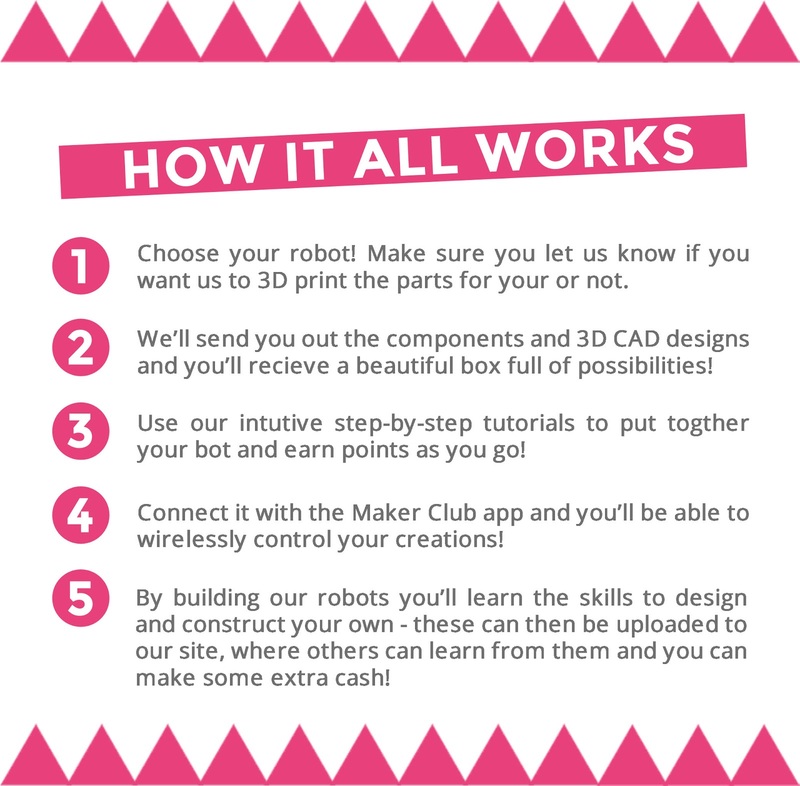 Maker Club: Learn to code, design and build 3D printed robots! At Maker Club, we make 3D printed robotics projects that teach electronics, programming and CAD design. Every project is remote controlled using our Arduino-based bluetooth chip, the MakerConnect, and our iOS and Android apps. All the parts for the robots are interchangeable, like Lego, so once you’ve got the hang of things, there’s almost nothing you can’t invent. Check out our Indiegogo campaign! At the heart of Maker Club is our ethos that making is for everyone. No matter your age or background, given the right tools, you can create something amazing. Founder and CEO of Maker Club, Simon Riley, began his own Maker journey at university. Although he finished with a master’s in electronic engineering and computer science, he felt disillusioned with the way it was taught to him – it was stripped down to just numbers and figures, with no creativity, and most importantly, no fun. As Simon came from a family of teachers and educators, he knew that learning could be an engaging and fascinating process, and that teaching should be about inspiring curiosity and creativity, rather than copy-and-pasting knowledge down a generation. Through his volunteering with local Code Clubs, he realised the best way to inspire creativity is through hands-on learning. Theoretical knowledge becomes more tangible when learners, especially young children, can see it’s real-world effects. For example, when teaching a child how to code, if they can see how their lines of code translate into the physical movement of, say, a robot arm, they get a real sense of how their book-learnt knowledge has a real world application, as well as getting to interact with their own awesome robot. With this in mind, Simon started Maker Club. Instead of trying to improve on the current curriculum, we aim to help learners and wannabe Makers engage with STEM subjects by giving them fun, hands-on projects to make at their own pace, with the potential for them to be as creative as they want to be. To that end, we have created our very own MakerConnect chip and mobile app, which can be used to give smartphone-control to almost any Arduino-based project. The chip itself is based on the Arduino Nano, but with the added bonus of bluetooth connection. With a Bluetooth and Bluetooth LE version, we can connect the MakerConnect to the phone, and from there to the internet – enabling almost limitless possibilities for invention and collaboration. To get you started on your Maker journey, we have designed a bunch of cool robots you can 3D print and construct in your own home: the Grabber, the Quadmonster, the Insectoid, and our Carduino. Each of our projects come with step-by-step instructions and access to our online gamified learning system, which guides you through creating your robot and gives you the skills to create your own projects. 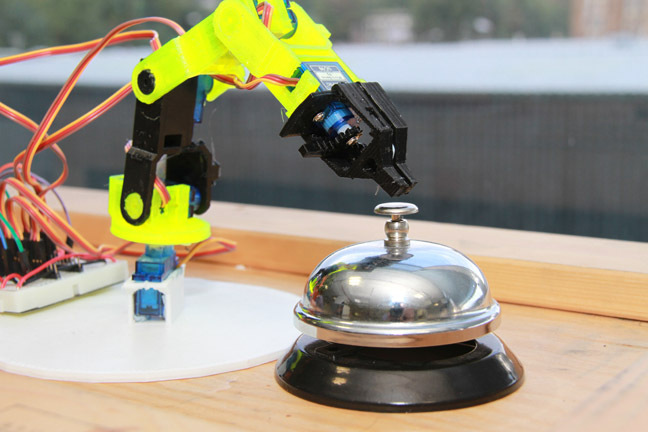 As we send you the CAD designs the possibilities for customisation stretch as far as your imagination – hack your home with robo-switches, turn your Carduino into a Delorean with a custom 3D printed shell or attach a cotton-bud catapult to your Insectoid. To find out more please view our campaign or our Website.